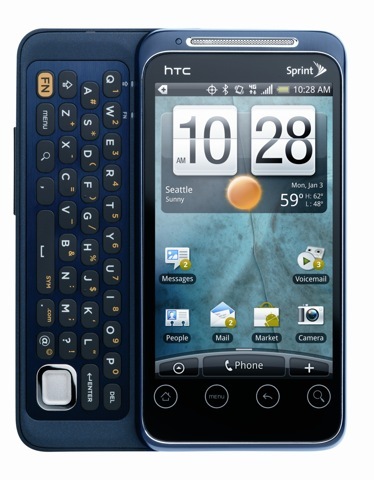 Sprint has not done the best job at keeping the HTC EVO Shift 4G a secret. Our previous knowledge hinted at a January 9th launch, but it seems that we were off by a few days. The EVO Shift 4G runs on Sprint’s 4G network and can act as a mobile hotspot with up to eight Wi-Fi enabled devices connected to it. The phone runs Android 2.2 with HTC Sense to make for an even better user experience. The HTC EVO Shift 4G has a 5MP camera, 720 HD camcorder, and a 3.6-inch capacitive touchscreen display. Check out the press release after the jump. · 3.6” capacitive display with pinch-to-zoom and tactile feedback. · World-class HTML browser – quality that rivals that of netbooks. · Android 2.2, with access to more than 100,000 apps on Android Market. · Simultaneous voice and data capability in 4G and Wi-Fi coverage areas, enabling Web surfing and more while talking. · GoogleTM mobile services including Google SearchTM, Google MapsTM, Google TalkTM, GmailTM, YouTubeTM, and syncs with Google CalendarTM. · Access to Google Goggles™ to search with pictures instead of words. · Updated HTC Sense, highly acclaimed user experience, which includes FriendStream™ to integrate Facebook, Twitter and more into a single flow of updates. · Messaging – personal and business email, IM and text messaging. · 3G/4G Mobile Hotspot capability – connects up to eight Wi-Fi enabled devices. · 4G data speeds (WiMAX) – peak download speeds of more than 10 Mbps; peak upload speeds of 1 Mbps; average download speeds of 3-6 Mbps. · 3G data speeds (EVDO Rev A.) – peak download speeds of 3.1 Mbps; peak upload speeds of 1.8 Mbps; average download speeds between 600 kbps and 1.4 Mbps. · 5MP autofocus camera and 720p HD camcorder. · High-quality video streaming and downloads at 3G and 4G data speeds. · Capture and share HD-quality video (720p) from your phone. · Media player with 3.5mm stereo headset jack. · FM radio and Amazon MP3 store. · Amazon Kindle – an e-Reader in the palm of your hands, with you everywhere you go! · Sprint applications including Sprint TV® and NASCAR Sprint Cup MobileSM. · Built-in WiFi®: 802.11 b/g/n. · Digital compass, G-Sensor, proximity sensor, light sensor, GPS. · Expandable memory: 2GB microSD card included; supports up to 32GB. · Qualcomm® MSM7630 (800 MHz) processor. · Dimensions: 4.6″ x 2.3″ x .6″ (LxWxT). · Main display: 3.6” WVGA (800×480) 65K colors. · Battery life: 6 hours of talk time*. · Standard removable 1500mAh Lithium (Li-on) battery. · Memory: 2GB ROM, 512MB RAM.